The connection between the yard and the inside of the dairy should be designed to encourage cows to enter. Poorly designed entries will have a huge impact on cow flow and milking efficiency, and may affect cow welfare. Improving the dairy entry increases work efficiency and reduces stress to both stock handlers and cattle by ensuring cow flow is maximised. Injuries will also be reduced if there are no hindrances or obstructions to the smooth flow of stock. Safe, reliable footing is essential so cows can move confidently. Scabbling the surface or grooving the concrete if slippery is an option. The slope of the entrance to the dairy should not exceed 4% (1 in 25). The milking area should be open to sunlight if possible. Cows moving from a sunny outside holding yard may hesitate at the entrance if it is much darker inside. Sharp, dark shadows across the concrete can be interpreted by cows as a barrier, causing them to pause before crossing. When it is dark make sure cows do not have to look into bright lights as they approach the dairy entrance. Clear cow entrances, exits and platform areas from obstructions. Although not essential, a single file entry race can help cow flow. Cows in the race cannot be bullied by other cows, so less dominant cows are more likely to enter of their own accord. 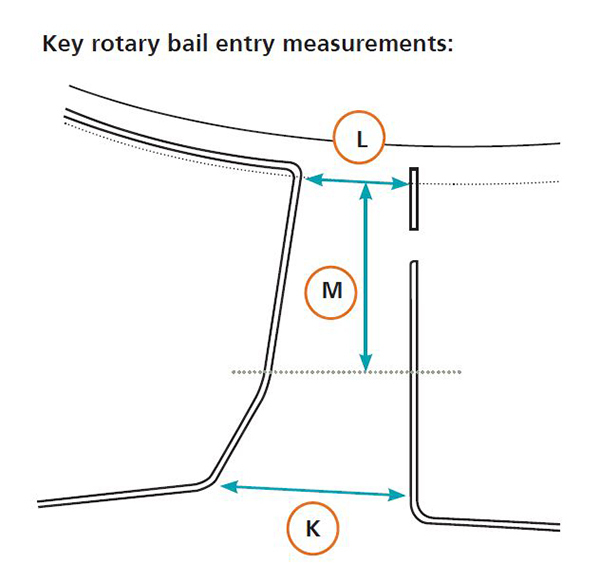 Key rotary bail entry measurements. K=around 1200mm, L=around 900mm, M=around 2500mm. Cows walk onto the platform in single file. They should be at least one cow length (approx. 2m) long. Two cow lengths (3m) are beneficial if you need to slow cows down for electronic identification systems, or when feeding in bail. There is a slightly flared entry from the yard which allows the next cows in from the yard to be encouraging the cows in front on to the platform. Left side good (horizontal pipes mounted cow side of vertical pipes), right side bad (sharp edge to catch hips). There is rubber matting to minimise lameness to reduce slippery surfaces as there can be considerable pushing in the entry area. There are no places cow can hurt themselves e.g. protruding pipes and edges. 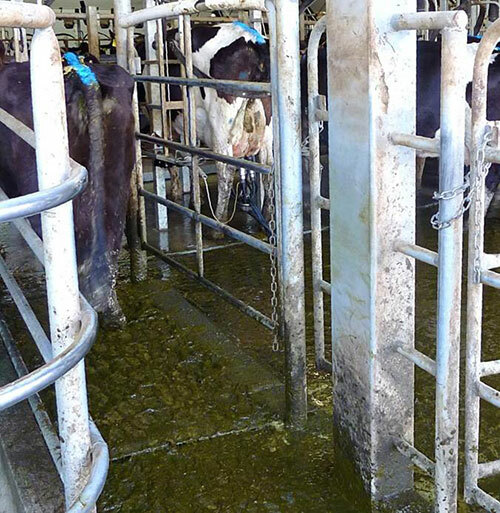 Pipe work should be flush across cow contact surfaces (horizontal pipes on the cow-side of vertical posts for example).